What you can learn from one commuter train line about anticipating your customer’s needs. 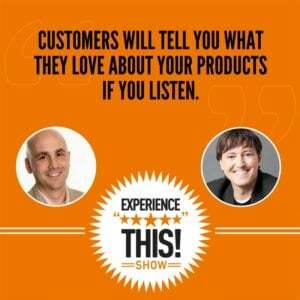 Why listening to customers is more vital than ever as technology gets more and more complicated. Chris Strub’s journey volunteering in 50 states over 100 days. What you can learn about customer experience from Star Wars. Dan: Join us as we discuss why technology is never as easy as it should be, how a simple piece of paper can change your workday and one man's journey across all 50 of the United States. Joey: Confusing, training and tripping? Oh, my. There are so many great customer experience articles to read but who has the time? We summarize them and offer clear takeaways you can implement starting tomorrow. Enjoy this segment of CX Press, where we read the articles so you don't need to. Dan: This week's CX Press article, comes to us from Nilay Patel on a website called The Verge. The title of the article, which I absolutely love is called, "Everything is Too Confusing." I mean, Joey, it's basically what our entire show is about. Joey: I know, I love this one. It's so true. Dan: Before we get into the premise of the article, I want everyone to try to remember the last time you opened up a new smartphone. Now, if it was an iPhone and I have to imagine that if you are not an iPhone user and you're an Android user, that this is also the case but certainly, with iPhones, you may have noticed that it basically comes with no instructions. There are lots of big assumptions that Apple or Samsung are making and not providing customers with any instructions, that you already know how to plug the phone in, that you know how to turn it on or set it up or link it to your network provider, find your WiFi, and that you know where to go when you get stuck. Now, the process for setting up a phone is fairly straightforward or so it seems but you have to wonder whether it is for everyone. This is where Nilay's article comes in and what I really like is he says that the tech industry is starting to make too many assumptions about people's understanding of technology. And that basically, technology's evolving faster than anyone could possibly be expected to keep up. He compiled a list of actual questions that he had heard from friends and family, varying ages, varying professions and the list is absolutely fascinating. For example, in the article, he says, "Somebody asked what's the difference bluetooth and WiFi? Or what's the difference between Hulu and Roku? Or what's the difference between your AppleID, your iCloud ID and your iCloud password and why can’t Siri play Spotify?" And perhaps my favorite, and this is a direct quote, "Does Alexa always listen to you like Facebook?" Yikes. Joey: Wow, and we didn't even include the one in ... Sorry to do this publicly to you Dad. My Dad recently, we were hanging out and he was asking me all about the hot stick. How do I make the hot stick work? I was like, "What are you talking about?" He's like, "That thing on the TV that lets us watch shows on Amazon." I was like, "Oh, the Fire Stick." Joey: Gotcha. But it brings up an excellent point, the technology, I think lots of companies have this thought that the people that are using their product have a certain level of tech savvy and depending on the product and depending on its target demographic, they make some pretty big assumptions but that's not the reality. Have you ever been in a room when a speaker ask, "Well, are there any questions? Oh and by the way, there are no dumb questions." I think the same philosophy holds true here. There actually aren't any dumb questions because if you, as the customer, are asking how does this work, it means that the person providing the device or writing the instruction manual or creating the packaging didn't create something that is easy to navigate as they presumed. What I think is interesting here is, we look at somewhere like Apple, they make products that are pretty intuitive to use right out of the box. The problem is a lot of other tech companies have presumed that, well, because you can use it right out of the box, if it's an Apple, maybe you can do that with our product as well. Yet, that's not always the way it works. Nilay also correctly points out that these types of questions from consumers beg a whole bunch of questions of the tech industry. Questions like, "Why doesn't all of this stuff work together better? Why should anyone know why search works in some apps but not in others? Why do so many people need to remember so many passwords? And these smart assistants that are 'smartphones,' are they actually making things easier or more complicated? And I'll take it one step further, are they actually making us feel smarter or dumber?" Dan: Yeah, I mean it's gotten a little bit scary. I know there was a story going around recently about somebody who had an Alexa and a Google Home and the two devices started talking to each other, which is just really bizarre. But something you were saying there struck a chord with me because I've said something similar for a long time and probably on this show, which is, "You could build the best mobile app in the world and your IT department could tell you that it's a great app that's easy to use and your marketing people could tell you it's a great app that's easy to use and your engineers can tell you it's a great app that's easy to use but if your customers tell you that it's difficult to use, then the answer is, it's difficult to use. Period." It doesn't matter what all of your internal employees think. What I really liked about these questions is some of these questions, I'm guessing our listeners were like, "Man, that guy's dumb." Then others, they might've been like, "Ha, I'm not sure I know the answer to that question either." Joey: Absolutely. I think, again, it goes back to the point. When we're deeply immersed in it, regardless of what your business is, you know your business better than your customers as a general rule. I think a lot of businesses run into this challenge, where, if the customer doesn't know how to navigate doing business with them or the customer doesn't understand how to do all the updates exactly at the right time in the right way, the business gets frustrated. When the reality is, it's the job of the business to provide for the customer and to make it easier. We were in a situation recently where my wife was getting a new iPhone and she says to me, "Oh, do you know what your iCloud password is?" And I said to her, "If you were to offer me a billion dollars right now tell you my iCloud password, you would be able to keep the billion dollars." Yet, if you were to ask my wife not only what her current password is but what the last seven passwords are, she would absolutely remember that. She's incredibly more tech savvy than I am and so a business that's doing business with our household, if they're talking to my wife they can assume a pretty high level of computer knowledge. If they're doing business with me, it's maybe higher than the average bear but it is certainly lower than my wife's. Again we need to be taking into consideration who our customers are and making sure that we're properly introducing them and helping them navigate through using our products and services. Especially, when it comes to technology. Dan: Totally and I will say that passwords are the bane of my existence as well. Let's go to the takeaways. I think there's three of them. The first is, remember that not all customers are tech savvy. You know, I worked in the healthcare industry where most of our customers were seniors, aged 65 and older and you really had to take a moment on the website and the mobile app and start to think about how the seniors use things that are different. I mean, my Mom on her iPhone, has the font set to a really, really large font that, to me, I kind of joke with her that there's only three words on every screen but if that's how she reads, then that's how companies that are talking to her need to design their mobile apps. The second is to anticipate use cases, that's prepare accordingly. As we've said on the show before, not every customer is the same and not every customer's going to use your device or your product or your service in the same way and it isn't common on the company to think about the various use cases and make sure that they're addressed. Then, When all else fails, listen to customer feedback because customers will tell you what they love and can't stand about your products or services and if you listen to them, you can continuously improve and iterate and make the experience better in the future. Dan: It's the small things that often make the biggest impact on the customer experience. I feel like we come back to this again and again on this show. One small thing that you can do to make a huge difference in your customer lives is just anticipating their concerns before they have them. The example that I want to share today does just that in a simple and elegant way. So, I often commute from the suburbs to the city and what I do, I take the Metra commuter train in Chicago. Now, Metra has always had the reputation of being fast, clean and on time. In fact, lots of people say that you could set your clock to the Metra train schedule. They've done a really nice job of modernizing their trains with power plugs and onboard WiFi but honestly, that's becoming table stakes. Joey: I'd be willing to guess that there are a lot of angry passengers. Dan: True, and why do you think they might be angry? I mean, besides the obvious, that no one likes being late. Joey: Well, I think that no one likes being late, sure. But I think it's the consequence of being late. So my gut instinct is that they're heading from the suburbs downtown in the morning on a weekday, chances are better than not, that they're going to work or going to an interview and they might find themselves being late to a meeting or if it's a job where they have to clock in, they might actually get in trouble for being late, they might get docked pay for being late. There's some pretty big consequences for the train not showing up. Dan: Exactly. Metra has anticipated that use case. You know what they do? For every train that is late, and again, this, luckily, doesn't happen very often, they put a couple of people in the train station just as you exit the train and those people are handing out a train delay notice. Joey: Okay, I got to ask. I've ridden on the Metra before, but thankfully never one that was running late. What is a train delay notice? 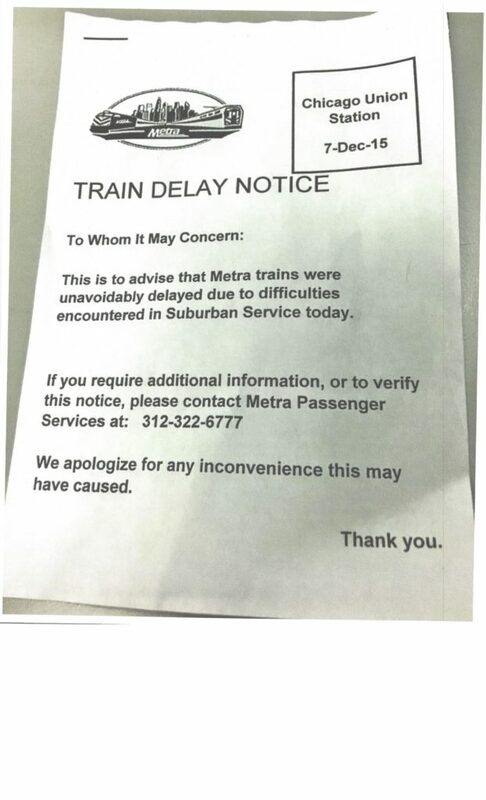 Dan: A train delay notice, which is stamped with today's date, says the following, "To whom it may concern, this is to device that Metra trains were unavoidably delayed due to difficulties encountered in suburban service today. If you require additional information or to verify this notice, please contact Metra Passenger Services at," and they give the phone number. "We apologize for any inconvenience this may have caused. Thank you." Joey: I love it. This is like the ultimate grown up version of a note from the doctor or my dog ate my homework type thing. It's the thoughtfulness of Metra recognizing that because of their delays, which obviously were not caused by the passengers, the passengers are going to experience some consequences and so they put together this note, which obviously, it sounds like it's a standard note that they just update with the day of the delay as need. What I also love about this is that they say, "To verify this notice." Right? It's almost like they anticipate that some employers might receive this notice from their employees and be skeptical about it and so, they're giving you that feedback loop to say, "No, it's a real deal. You can reach back out and find out if this really was a train delay." Dan: Yeah, and if you compare this to delays on other forms of transportation, airlines or other trains, usually as a rider, what you get is a verbal apology. "We're really sorry that our flight is delayed today," but there's no instinctual thoughtfulness around, "We're sorry that you missed your meeting today or we're sorry that you're not going to make it to your friends wedding because the flight was canceled," or whatever. That doesn't seem to be there. That's what I really love about this notice and this is printed on a quarter of a sheet of paper so they're probably printing four per sheet and cutting them out. It's not particularly tech savvy but it's easy, it's simple, it costs them almost no money and I think it makes a big difference especially to those folks that you pointed out that might be clocking into work and there is a difference between clocking in at 9:02 and 9:00. Joey: Absolutely. I mean, you mention it's easy, it's simple and it's cost effective. I'll take it one step further. It's thoughtful. I mean, at the end of the day ... What's fascinating to me about this story is public transit, across, at least the United States, isn't notorious for being thoughtful and considerate. Usually, it's, "Yeah, yeah. Whatever. We're providing the service. We're doing the best we can and often, the best we can feels like dialing it in at the most." What I love is that there's this willingness to recognize by Metra, that there are going to be cascading consequences for the delay. You know, you mentioned the airlines, this is something where airlines, I think, have gotten much better about letting the customers know that there's going to be a delay but I've found myself in plenty of situations where the delay means I'm going to miss a connection, which means I'm not going to be able to get to the place I need to by that day and there's a rollover to the next day and half the time, even just some empathy from the gate agent or from the person that works for the airline saying, "Hey, I understand that this is probably inconveniencing you to a greater level. I'm so sorry for that. We're going to do everything we can to take care of you." Even if it doesn't meant that it changes the end result, that brief moment of humanity, that brief moment of thoughtfulness makes all the difference. I think there are a couple of things that we want to take into consideration here. Think of these as our key takeaways or things that you should be doing. Number one, your problems can cause other people problems. When something with your product or your service is causing an issue or causing a problem, whether as inconsequential as a delay or as significant as something failing to work, recognize that there's this cascading effect and try to work your way down the chain to anticipate where the customer is and figure out how to take care of their problem. Number two, anticipate the emotions of your customer. I think as we look to the next 5 to maybe 10 years in business, this is going to be where all the advancements are made. How can we properly anticipate and then address the emotional rollercoaster that our customers are on when they do business with us. When they're at a low, we need to be ready to jump in and boost them back up. When they're at a high, we need to be able to celebrate with them. So what can we do to anticipate the emotional status of your customer as they navigate through your customer journey? Finally, last but not least, number three, have fun with this. When we look at the language of this Metra notice, it's not really that it's fun per se as much as it's human. They could even add a little more to it by having the people who are handing out the notices on the train ... You want the notice to sound real and professional so folks can give it to their employers but, I could see something where the people on the platform are saying something like, "Get out of jail free cards," or, "A note from Mom, so you don't get in trouble for being late," that they could bring a little bit of fun and humanity to the process in a way that helps that experience be the remarkable experience it could be, instead of being the frustrating or anger inducing experience that it would be. We spend hours and hours, nose deep in books. We believe that everything you read influences the experiences you create, so we're happy to answer our favorite question. What are you reading? Dan: So today, I wanted to talk about a book that I've been reading by a very good friend of mine, Mr. Chris Strub. Now, Chris is one of the nicest most genuine guys I have ever met and his goal in life, literally, is to help other people. He's been doing this by traveling around the country and working with various non-profits to teach them how to do social media better, specifically live video so that they can acquire a bigger social following, hopefully, solicit more donations and volunteers and generally, let the world know all the good that they're doing. Now, in 2015, Chris did something absolutely extraordinary. All by himself, with zero outside funding, he drove his own car to all 50 states. Now, to be fair, he did have to fly to Alaska and Hawaii. In each one of the states, he volunteered for a children's organization. He did this by the way in exactly 100 days. Hence, the title of his book, "50 States, 100 Days." Joey: Well, Dan, I feel very fortunate that I have not achieved Chris' goal of all 50 but I'm only 1 state away. I've got 49 down, 1 to go. Yeah, sooner or later here, hopefully sooner, I'll make my way to Alaska and be able to complete the full journey but it definitely took more than 100 days, which for our listeners, I think, it's important to note having spent some time in all of the states, getting from state to state when you're in the Northeast, that's pretty easy. You can go through three or four states in a matter of one day. You get out West, and it'll take you an entire day to drive across the state or the better part of a state. You know, better part of day anyways. For example, driving across Nebraska takes forever. If you're ever in a situation where a doctor give you 3 months to live, go drive across Nebraska and it'll feel like you get to live an extra 30 years. I think what's great about Chris' story is that he did something that a lot of people have probably thought about but he took it one step further. He didn't just approach it as a tourist, "Oh, let me check some boxes." It sounds like he actually went and had these experiences. He experienced people who live in the states, he helped them tell their story so he was working, he was playing, he was connecting and he was able to do it in this small period of time that not only produced a cool book but, I imagine, you know Chris, I haven't had the pleasure of meeting him yet, had a pretty big impact on his life because you can't see all 50 states in that short of a window of time and not have a much better understanding of the different parts of our country and how they impact people's thought processes and their beliefs and their ideas and their attitudes, when you're getting to see them across a shortened window like this. Dan: Absolutely. Two of the remarkable things that he did on his trip, that, I think, lend themselves to creating an experience, the first is that in every state, Chris had someone from the non-profit organization sign his car. So he's driving this 2007, Honda Accord all the way around the country and every time he stopped in a non-profit, he had someone from the organization sign their name and an inspirational quote. As he traveled the country, his car became filled and filled with all these amazing people and memorable quotes. That, in itself, became an experience. Both for him and to the people, every place that he visited, the people that got to contribute to the quotes on the car and then, even the people that passed him by on the highway in between stops. Obviously, his car is fairly noticeable. I thought that was such a cool thing that he did. Joey: I love it. I think one of the things we should do because you had a chance to share that, we'll include a photo of the car in the show notes. Seriously, it's a little cheesy but it's also awesome, which how ironic how often those two things, cheesy and awesome, line up with each other. Joey: It's certainly the case with Chris' car. Dan: Absolutely. And the second thing that is just truly remarkable is if you talk to Chris, and by the way, he is very active on Twitter. He's @ChrisStrub, and he's very, very responsive. Chris can recall every single stop on the journey by memory. If you say to him, "Wisconsin," he will immediately starting blurting out, "Oh, that was stop number 31 and we went to the Wisconsin Youth Company in Madison and that's where I met Executive Director Kaye Stevens and I taught her Snapchat. And we were supposed to go with some kids to a splash park that day but the weather forced us to cancel." It is absolutely incredible. I think that the only way that he could do that besides being Rain Man, is that he created a memorable experience at every single stop and that takes a lot of work. He stopped at all 50 states only over the course of a 100 days. He made sure to create a memorable experience at every single stop to the point where he can rattle off those experiences with an unbelievable amount of detail without even having to think about it. I have to say I've been reading this book, it has caused me to stop and sort of wonder what I've done to make the world a better place lately. Joey: Yeah. In many ways, Dan, I'm not surprised that it's producing that kind of thought process. Because what's clear is that Chris enjoys traveling, he enjoys people, he enjoys helping, he enjoys teaching and the ability to tie all of those things together into this epic adventure over the course of 100 days to travel to all 50 states is pretty awesome. I'm going to be a little bold here, as I have a tendency to do, especially as we get towards the end of an episode. I'm just going to encourage and ask everyone who's a listener, if you enjoyed listening to the Experience This! Podcast, try to go somewhere new this year. Go to, even if it's anew state, a new country, even if it's a new town. Hop in your car, hop on a train, get outside of the norm. Go explore even a neighbor that you've never been before because the fact of the matter is, travel creates experiences. You can't travel without having some interesting experiences and interesting stories. I've had the pleasure of meeting folks from all over the world and one of the things that is often a common bond or a common denominator amongst people who travel is being able to tell stories of their travel. If you have that opportunity to connect with someone who's from a different state or a different country or even a different city, it gives you some points of commonality to be able to have a conversation with. People are always amazed when they find out that I've been to their town or I've been to their city or to their country and it creates automatic rapport. At the end of the day, isn't that what we're trying to do with our customers? Regularly create points of commonality and rapport? So, I highly encourage you to be inspired by Chris' journey. Check out his book and make some commitment to go traveling in the coming weeks and months. You won't be disappointed. Dan: I love it. While you were talking, I was already on the web, booking my flight. We'll see where I'm going to go, but I love that idea. I've actually always had this dream of if they would let you do this, of just showing up at the airport and basically, seeing which planes have a couple of extra seats in it. Joey: By the way, just so you know, they absolutely will let you do that. Joey: I have done that. It's incredible. They totally will let you do it. They're not the cheapest seats but sometimes you can get a gate agent who's feeling like having a little fun like you and you just say, "Where am I flying to today?" Yeah, it's pretty good. 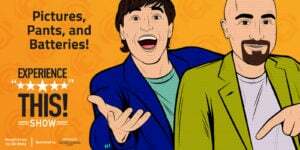 Dan: All right, so check out my buddy, Chris Strub's terrific book, "50 States, 100 Days," available in paperback or in ebook and the ebook is pretty cool because it's very interactive. It has links to all of his blog posts and all of the videos, all the Snapchat stuff that he filmed while he was on this trip and you could click right into it as you're reading the ebook. Both of them are available at Amazon or at Chris' website, which is teamstrub.com. Joey: Listen in while we try to stomp and surprise each other with a fantastic statistic from the worlds of customer experience and customer service. It's time to check out this number. Okay, Dan, this week's number is 7.5 billion which is definitely the largest number we've ever used on the Checkout This Number segment. So, 7.5 billion, what do you think it refers to? Dan: Well, obviously, it's the number of listeners we have in the Experience This! show. Joey: I absolutely love your enthusiasm, but alas my friend, that is a bit of wishful thinking although, tell your friends download and listen to the show. Actually 7.5 billion refers to the number of box office dollars generated by the 10, yes we're up to 10, Star Wars movies. Of course, that number's still growing. This statistic comes to us from Smarter CX by Oracle, which you can find at smartercx.com/experiencethis many remember guys. Go to the /experiencethis piece because it lets them know that you're going and checking out their site. If you're wondering what this has to do with customer experience, they you're going to want to look up the article, "Three Things that Star Wars Teaches Us About Customer Experience." You'll find that on the Smarter CX website. Dan: And you can find that and more, great customer experience content, it's smartercx.com/experiencethis. This is Oracle's new website for professionals who are building a next generation of customer experience. Wait a minute, next generation. Now we're ... Wrong. Joey: Wrong, wrong movie. Wrong movie. Dan: [crosstalk 00:27:48] metaphors. But anyway, thanks to Oracle CX Cloud for sponsoring the Experience This! show.